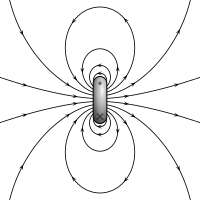 "We're passing through the magnetic field! Switch your deflectors, double-front!" Magnetic fields were used throughout the galaxy to contain the atmosphere within starship hangars, as well as to protect pilots who were forced to abandon their vehicles while in realspace and did not have the benefit of environmental or vac-rated life-support enviro-suits. In addition, magcon fields were used on starships to help shield against the effects of ion storms and other forms of potentially-damaging interstellar radiation. Fields of this type kept in air, but were notoriously poor at retaining heat, resulting in cold temperatures. This article uses material from the "Magnetic field" article on the Starwars wiki at Wikia and is licensed under the Creative Commons Attribution-Share Alike License.